With USB in hand, we winged south from Punta Arenas, across Magellan Strait and Beagle Channel, to Port Williams on Navarino Island. Our main purpose was to meet and stay with the Yaghan community – descendants of the sea-faring people that travelled the waters and settled the islands of southern Tierra del Fuego over 10,000 years ago (well before names of colonial explorers were imprinted on the landscape). Our USB contained digital copies of journal entries, letters and photographs that documented the journey of Walter Baldwin Spencer and Jean Hamilton, who sailed together to Tierra del Fuego from the UK in early 1929. Jean Hamilton was a librarian and anthropologist. Walter Baldwin Spencer was her lover. He was a biologist and anthropologist best known for his work with Frances Gillen, studying the Indigenous people of Central Australia and Northern Territory. He is considered a pioneer of anthropological ‘field-work’ – an intensive method of going, staying, listening and observing. Today, we must consider his work with a heightened awareness of the colonial context, paternalistic attitudes and problematic Darwinian theory on which it was based. While realising Spencer’s dream to follow in the footsteps of Charles Darwin, the pair eventually found themselves on Navarino Island, conducting anthropological field-work with the ‘almost extinct Yaghan tribe’ (1). Hearing word of Juanna, an ‘old Yaghan woman who spoke English’ (2) , they travelled to Hoste Island to seek her assistance. As the winter snow descended, Spencer became ill and was not able to leave the island. He died of heart failure in a storm bound hut, on 14 July 1929. Aside from her own writing, there is little historical account of Jean Hamilton’s field-work, of her rapport with the Yaghan ‘witches’, or of the treacherous five-day journey she undertook following Spencer’s death to return his body and ‘precious museum material’ (3) to the mainland. As was common at this time, these Yaghan belongings were later donated to Museums, namely the Pitt Rivers Museum in Oxford, UK and the Melbourne Museum in Victoria, Australia. 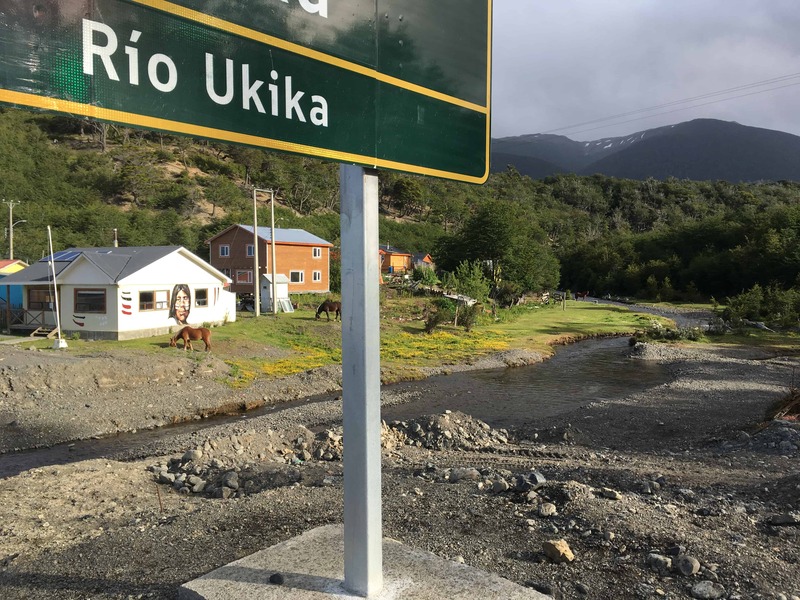 Museums across the world are rethinking their collections and, in this spirit, the Melbourne Museum allowed Camila Marambio access to their Yaghan collection, which she photographed and planned to share with the community at Ukika village on Navarino during her next visit to Tierra del Fuego and Cabo de Hornos. So, one December morning in 2018 we met with elders of the Yaghan community (thanks to Alberto Serrano, director of the Museo Martin Gusinde). We shared with them news of the collection and projected Spencer’s photographs of his journey. Memories were engaged, words spoken, places and people named, silence kept. Camila spoke of her position as honorary associate at Melbourne Museum, leaving an open invitation for conversations to continue regarding the Yaghan belongings and Spencer’s documents that travelled to the UK, whilst his body remained in Punta Arenas. Three days in Ukika was not long, but enough time to sit in gentle conversation with elders, catch up with an old Becoming Beaver friend and dwell with the seaside, the moss and the forests and winds of Bandera Hill. We sniffed for a scent of Maku Kipa (Firebush Woman). We visited Omora Ethnobotanical Park, and left questioning the benefits of ecotourism. Does ‘tourism with a hand lens’ contribute to conservation of the region or is it another narrative inscribed onto the landscape that leaves little room for acts of awe or going off track? How can a Coastal Curriculum allow for multi-dimensional narratives of place and po-ethical acts to seep into each other and permeate beings? In practice, the answer is constantly evolving. Because stories are important, particularly the ones we are unaware of. Because we need to question who is telling whose story. Because when one is granted a privilege, that person is also granted a power to transform history, to do justice to the untold version of it. Because Spencer’s need to record what he observed in the interests of expanding knowledge and capturing what would soon be ‘lost’, is a need that remains present in much scientific and social research and needs to be questioned. Because photographs and cultural objects are mute. In their muteness, they allow interpretation, but it matters who speaks of them. What words would the living Yaghan community speak of these belongings that lie out of sight in climate-controlled museum basements? Because the Yaghan culture is alive. It’s alive in Martin Calderon’s boat building and the days he spends on the water, navigating memories. It’s alive in Julia Gonzalez’s baskets woven in rush gathered from the marshes. Its alive in the stories and traditional language of Christina Calderon who shares with those who take time to ask. It’s alive in David Alday and the political work he does as president of the community. It’s alive in Veronica and Violeta Balfor’s patching of their family tree. It’s alive in all the young people that live in Ukika and their brothers and sisters that live abroad too, all Yaghans. Caitlin Franzmann (Artist) and Camila Marambio (Curator), with the participation of Alberto Serrano, Martin Calderon, Julia Gonzalez, Violeta Balfor, Veronica Balfor, Cristina Calderon and the current President of the Yaghan community David Alday. Thanks to Ana María Yaconi, Ivette Martínez, the Museo Antropológico Martín Gusinde, the Melbourne Museum and Rebecca Carland. G 2015 Light in the Dark Luz En Lo Oscuro: Rewriting Identity, Spirituality, Reality. Duke University Press, Durham and London.